We got back to Denver, and were still in our meat coma. We headed down to 1st and Broadway to walk around a bit and check out some of the shops. It was a sunday, so most were closed by then, but the walk was welcomed by our meat-filled bellies. 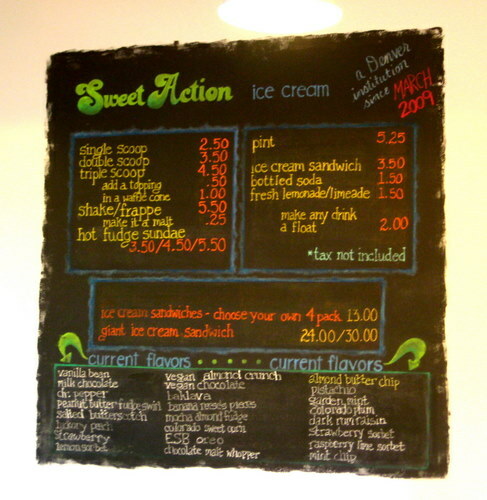 Eventually, we felt slightly peckish for a little something, so we stopped in at Sweet Action. It’s an ice cream shop! Not hard to figure out what to do here. They have some normal flavors and some more wacky flavors. They also have several vegan offerings, which is pretty cool. You can get shakes too and ice cream sandwiches. There are pints available to take home. 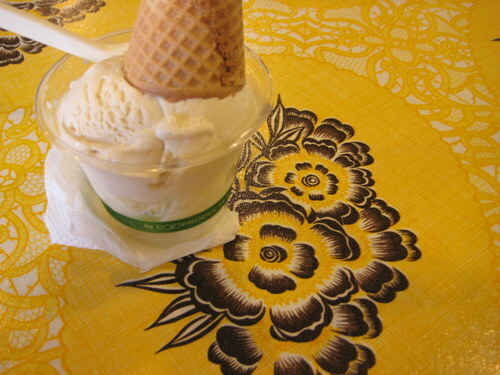 I got some salted butterscotch and some colorado sweet corn ice creams. I wanted the salted butterscotch to taste like salted caramel, but it didn’t really. But it was still good. The colorado sweet corn was quite lovely, with little frozen bits of corn. S also tried the sweet corn along with the colorado sweet plum. But we agreed that our favorite of the night was the corn! Corn ice cream! I love it!